Nice little rarity found on TradeMe last week. Thought I better "buy now". 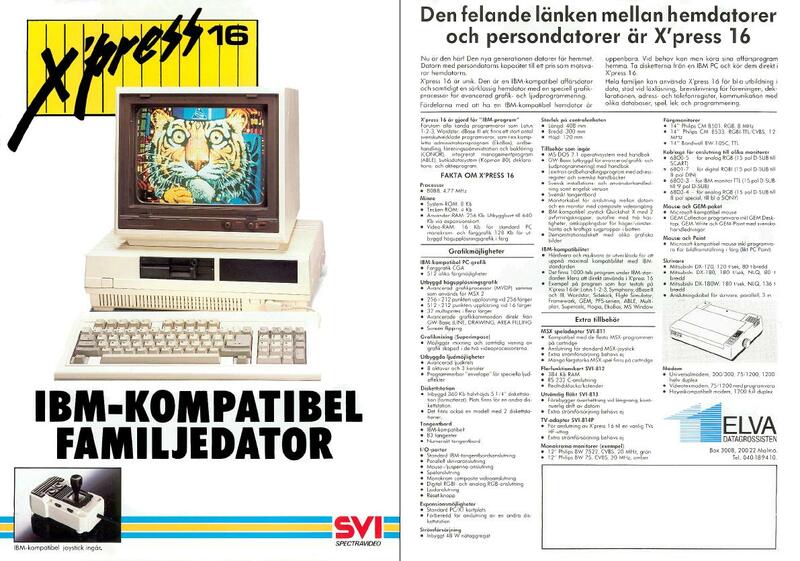 A Spectravideo XPress 16 - which was their last gasp before they stopped making machines. It *seems* like it is a 8088 IBM PC compatible with MSX2 hardware. I'll need to (somehow) find out more. I'll post up progress as I hopefully get it up and running. Included a monitor and keyboard. Very nice. I saw this pop up on Trade me and quickly disappear. If I was not so constrained for space I would have thought about it myself. I'll be interested to know how you get on with it. I had one when I was younger (not new, like something I got for $5 to play with). My only real memory was the PSU being on the weak side, and it wouldn't start up when I piggy backed a second generic 5.25" drive (memory a bit fuzzy). I went on the internet to find out what it was a year or so ago, but was never quite sure, but now I've seen your picture - it comes flooding back. Nice find. And yeah, I used to boot MS DOS off 360KB floppies if I remember correctly. Never knew about or used it's advanced features (MSX graphics etc). Just about to take it apart for a quick cleanup and some photos. I guess I better track down some MSDOS 360k floppies - you don't remember which version of MSDOS? I believe it will boot CP/M too - I would have no idea where/how that would happen. Love new stuff to learn. SpidersWeb wrote: Ah it is real! If it's PC compatible, it should be able to boot any version of MS DOS (even 6.22). CP/M-86 will run if MS DOS runs. If I'm remembering accurately (it was a very long time ago), I probably would've booted off MS DOS 3.3 which became fairly standard on 8088's and I would've had lots of those boot disks lying about. I don't remember it coming with special disks so hopefully it doesn't need a special version. If you get stuck for booters, send me a PM and I should be able to send one off. Here are a few photos of how it is constructed and a shot of the IBM PC 8088 compatible motherboard - with MSX2 chips onboard. The PSU is two parts - the blackbox transformer (which the power cord goes to) then the power board itself. The board is labelled as the Spectravideo 838 Power Board - Version 2.0. From what I can see with the connectors, it seems like pretty standard IBM XT stuff. If the transformer is what's broken, I'd also check the power switch in it is actually still functional. External power brick inside the case cracks me up Motherboard somewhat remind me of the Commodore PC-10/20 series. Thanks for that - I had a couple of ideas - but this gives me a good set of test cases! SpidersWeb wrote: External power brick inside the case cracks me up Motherboard somewhat remind me of the Commodore PC-10/20 series. You should see the inside of a TRS-80 Model 1 Expansion Interface. Not one, but TWO external power bricks nestled in the EI case...one for the expansion interface and one for the console/keyboard itself! how did you get on with the svi pc?? just i have some svi & msx stuff.. svi xpress 728 msx v1.5. also have the cpm & dos 5.25"..